Most people's hand-grip strength gradually diminishes as they age. Maintaining decent hand-grip strength levels can enable elderly people to more readily complete daily living tasks and may help them stay alive longer. A 2007 study published in "The American Journal of Medicine" concluded that lower hand-grip strength readings are a reliable predictor of an increased mortality rate. Testing your hand-grip strength can help to monitor this decline and can give an indication of risk. A hand dynamometer is used to perform the hand-grip test. The curved handle of the dynamometer mimics the pattern of your hand when making a fist. The handle is pliable and receptive to pressure against it. Attached to the hand-grip is a monitor that shows the strength of the squeeze in kilograms. More advanced models may have a digital readout. Perform a series of squeezes on the dynamometer with at least 30 seconds of rest between each squeeze to allow for optimal recovery. Perform the test from a standing position with your elbow bent at 90-degrees to the side of, but not against, your body. Grab the dynamometer with a neutral grip, with your thumb pointing up. Take a deep breath. 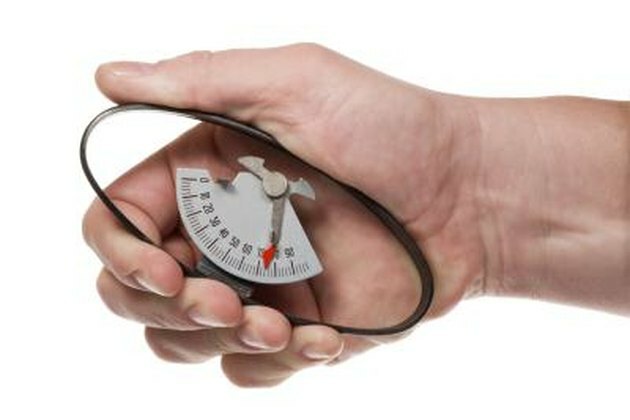 As you breathe out, squeeze the dynamometer as hard as you can for around 10 to 15 seconds. Record the highest value reached. Perform at least three trials for each hand. The highest value obtained for each hand is your score. Your test score will be specific to your age and gender. Also, measurement of hand-grip strength is usually based on your dominant hand. A large discrepancy of more than 5 kg between the two hands signals the need to see a specialist. On average, 30-year-old men will display about 40.25 kg of pressure when gripping the dynamometer, while 30-year-old women typically use 21 kg of force with their dominant hand. Men age 50 average 33 kg, while 50-year-old women average 17.5 kg. If your values are below average, consult with your doctor about potential causes for the low value and determine if using a weight-training program is appropriate. Resistance training exercises that utilize free weights, such as barbell and dumbbells, require the muscles in your wrist and forearm to activate to hold the weight. These types of exercises improve your grip strength and have the added benefit of training other muscles in your body.